Military Entrance Processing Stations, or MEPS, are the first stop for recruits entering military service in the United States. There are 65 MEPS locations in the U.S., with one in almost every state. States that do not have MEPS locations include Connecticut, Rhode Island, Vermont, New Hampshire, Delaware, Kansas, Wyoming, and Nevada. Recruits from those states will go to MEPS locations in nearby states. Those who do not live locally will receive lodging while they're at the MEPS station. Your recruiter will tell you which MEPS location will handle your testing and processing, and will schedule your visit to that MEPS location. The U.S. Military Entrance Processing Command is divided into two sectors of battalions: the Eastern Sector Battalions and the Western Sector Battalions. The dividing line between the two sectors runs roughly down the Mississippi River. The Eastern Sector MEPS stations serve the even-numbered battalions (2nd, 4th, 6th, 8th, 10th, and 12th), while the Western Sector MEPS stations serve the odd-numbered battalions (1st, 3rd, 5th, 7th, 9th, and 11th). 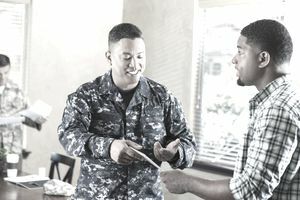 Before a recruit can join the Armed Services, he or she proceeds to a MEPS station for a list of tests designed to measure fitness for military service. After spending about two days at the MEPS station, successful recruits will either go home to await their date to ship out or will proceed directly to basic training. MEPS ensures that each new member of the Armed Forces (The Army, Marines, Navy, Air Force, and Coast Guard) meets the high mental, moral and medical standards required by the Department of Defense and the military services. Featuring modern facilities and equipment, today's modern MEPS bears little resemblance to the traditional image of the drab "Induction Station" known by previous generations of American soldiers, Marines, Sailors, airmen, and Coast Guardsmen. The first major step in your processing at a MEPS location will be to take the Armed Services Vocational Aptitude Battery (ASVAB), tests if you haven't already. This series of tests determine the course of your military career, so study and get a good night's sleep the night before. You'll usually take it in the afternoon of your first day at MEPS. The next day (for which you will arise quite early), you will complete a medical questionnaire and undergo an extensive medical exam, which includes a weight check, a hearing exam and a vision test. Following the medical exam, you will work with a service counselor to select a military job and then will undergo a pre-enlistment interview. The interview will cover any possible legal issues that could prevent you from enlisting. Finally, assuming you qualify for military service, you will take the Oath of Enlistment at that MEPS location.